Customize your landscaping according to your personal taste and lifestyle with hardscapes in Gretna. Heroes Lawn and Landscape designs and installs hardscapes in Gretna that can transform your landscaping into your personal paradise. Instead of letting your outdoor space go to waste, Heroes Lawn and Landscape will add hardscapes in Gretna to enhance its beauty and add to its functionality. Hardscapes in Gretna are man-made structures that are incorporated into a landscape design. 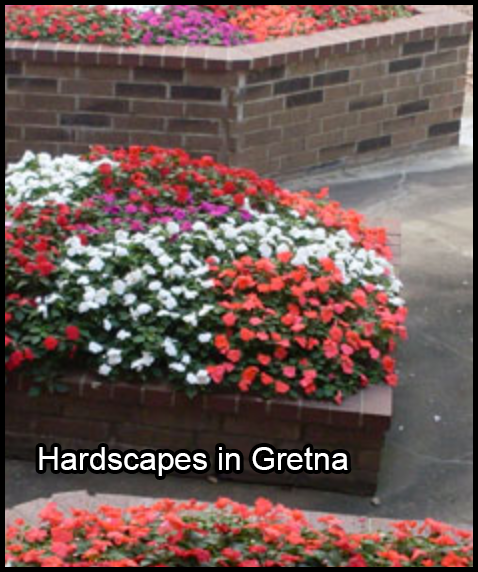 Some examples of hardscapes in Gretna are retaining walls, patios, and pathways. Used correctly, hardscapes in Gretna add visual appeal by enhancing the natural beauty of outdoor spaces. Hardscapes in Gretna may even add to the resale value of properties. Hardscapes in Gretna can turn a boring outdoor space into a valued extension of your home. For example, a custom-designed patio by Heroes Lawn and Landscape can make your backyard feel like a vacation destination. You can use your patio as a relaxing place where you can briefly escape from the noise and activity of the rest of your home. On your patio, you can lounge, read a book, do yoga, or simply gaze at your garden. You can even dine under the stars! Does your yard look plain and featureless? Consider having Heroes Lawn and Landscape build retaining walls on your property. These hardscapes in Gretna are very versatile. Apart from preventing soil erosion, retaining walls can also be used to build raised garden beds. Planting flowers and ornamental plants on raised flower beds are a great way to add color and texture to flat yards. Retaining walls are also a great option for sloped yards. These hardscapes in Gretna retain soil in steep areas where soil would normally crumble down from. Additionally, these hardscapes in Gretna prevent water runoff from collecting in low spots on yards. If you love throwing parties in your backyard, you can have Heroes Lawn and Landscape build a large patio that can serve as an outdoor entertainment venue. Heroes Lawn and Landscape can customize patios as well as other types of hardscapes in Gretna according to your preferences and goals. Patios can be built to accommodate dining tables and a grill. These hardscapes in Gretna can be made from durable materials, such as brick or concrete so that they can withstand years of regular use. With these hardscapes in Gretna, you can be confident when throwing outdoor parties. Heroes Lawn and Landscape can design and install pathways to improve accessibility in your property’s outdoor areas. Hardscapes in Gretna provide you with a resilient surface to walk on around your garden. Pathways also prevent damage to your landscaping or yard caused by excessive foot traffic. Do you want to have garden pathways installed on your property? Simply choose from a range of colors, textures, and materials, and Heroes Lawn and Landscape will do the rest. Picking out hardscapes in Gretna and deciding how to incorporate them into your lawn can be difficult. Thankfully, the team at Heroes Lawn and Landscape is always ready to provide you with guidance. Get some ideas on hardscape design: https://www.pinterest.com/explore/hardscape-design/. They will help you choose the ideal hardscapes in Gretna for your lawn. In addition, Heroes Lawn and Landscape will help you determine where it’s best to place these hardscapes. Gretna homeowners don’t have to lift a finger when they choose Heroes Lawn and Landscape to handle their landscaping improvement projects. Beautifying your lawn or yard doesn’t have to be difficult. Heroes Lawn and Landscape can handle all aspects of your landscaping improvement project, from conceptualizing to installing hardscapes in Gretna. Once your hardscapes in Gretna are constructed, Heroes Lawn and Landscape can also maintain your outdoor spaces. Learn more about Heroes Lawn and Landscape by giving them a call. To get a free quote for the installation of hardscapes, Gretna homeowners can contact Heroes Lawn and Landscape by filling out the form on our contact page. We can turn a humble backyard into an outdoor entertainment area by installing a custom-designed patio, and make hard-to-reach outdoor areas more accessible by constructing garden paths. By installing hardscapes such as retaining walls and steps, we can make your landscaping or yard more functional and visually appealing. Heroes Lawn and Landscape was founded by four friends. They noticed that home and business owners had to go to different companies for landscaping, holiday lighting, and other landscape improvement and maintenance services. For a new look for your outdoor spaces in Gretna. Turn to Heroes Lawn and Landscape for expert landscape design and maintenance services. Our Gretna team has the skills, experience, and equipment to implement a full-scale landscape design project for residential and commercial clients. We meet with our clients first so we can fully understand their landscaping goals. Also, we provide regular updates throughout the course of the project to ensure that our clients and our team are on the same page. Save time and money by having Heroes Lawn and Landscape install turf on your lawn instead of grass. You won’t have to fertilize, mow, or water your landscaping again! What’s more, synthetic turf is easy to care for. It’s also pet-friendly. Learn more about how we can transform your outdoor spaces into showcases by giving us a call. You may also request a quote by filling out our online form. We look forward to helping you achieve the lawn or yard of your dreams with hardscapes in Gretna.